Working as DC wedding photographers is great at a first-rate location like the St. Regis Washington, D.C. The best wedding venues in DC do more than just treat brides and grooms like royalty. Obviously, the great locations do whatever is necessary to make the future spouses’ wedding day unforgettable. Superlative venues like the St. Regis Washington, D.C. can do even more than that. They can actually improve the couple’s wedding photography. The layout, decor and overall vibe of a wedding location can turn an ordinary photo into something magical. Though not the be-all and end-all, the background of a matrimonial picture matters a lot. It contributes mightily to setting the scene, to adding context and to giving the whole image a particular look and feel. The best Washington, DC, wedding photographer can take even the ugliest backdrop and create a beautiful picture, of course. But when we can use the wedding venue to enhance our photos, there is nothing like it. The St. Regis Washington, D.C. is filled with spaces that can improve a bride and groom’s wedding photography. For example, its Beaux-Arts and Neo-Renaissance facade that faces 16th Street gives couples portraits an Old World touch. DC wedding photographers can achieve similar results taking pictures of newlyweds in the hotel’s luxurious lobby. The gold-inlaid ceilings, plush red velvet curtains and magnificent chandelier make any portrait look like a million dollars. Just to the side of the main hotel building is one of Washington’s hidden wedding venue gems: the Astor Terrace. It is a patio that offers brides and grooms that rarest of options: a green space in an urban milieu. The Astor Terrace allows couples to have an outdoor ceremony or reception with up to 250 wedding guests. Couples can then exchange their vows or to celebrate their nuptials surrounded by lovely green trees. And the whole time, they are just steps from one of DC’s main thoroughfares and the White House! The St. Regis Washington, D.C. suite in this photo is another example of how a space can improve wedding photography. The light that was coming in through the windows of the living room area was soft and gorgeous. Thanks to that, we were able to get some beautiful and flattering shots of the bride getting her makeup done. Her DC bridal portraits — taken by the room’s largest window — were similarly stunning. We took this particular image in the bedroom portion of the suite the bride had rented for her Washington wedding. As in the antechamber, the light was gentle and beautiful. Even though relatively little of the interior decoration made it into in this frame, there are still hints of what makes the St. Regis so special. For example, you can see the plush headboard with golden posts peeking out from behind the bride and bridesmaids. What really makes this picture of a DC bride and her bridesmaids so spectacular, though, is the moment. As is often the case, the emotions on display turn what would have been a standard portrait into something unforgettable. 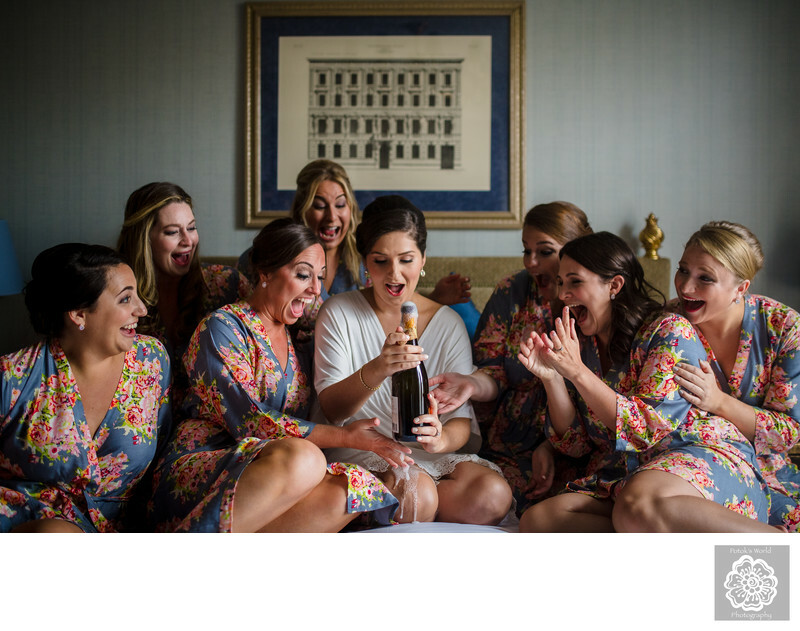 To liven up the wedding party portraits, we had asked the bride-to-be to open the bottle of champagne on the bed while surrounded by her bridesmaids. Our thinking was that a bit of movement and unpredictability would turn a posed shot into a more spontaneous picture. Plus, the introduction of the bottle would bring the bridesmaids’ focus to their friend/relative and away from the cameras. We had no idea, though, that the champagne would bubble over and spill onto the bride. But we are certainly glad that it did! That moment elicited some fantastic and genuine responses from all the ladies gathered there and led to a great image. Location: The St. Regis Washington, D.C. 923 16th St NW, Washington, DC 20006. Keywords: Weddings at the St. Regis DC (3).